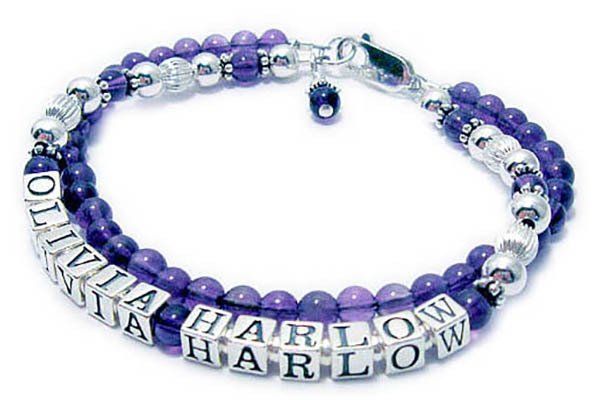 This is a 2 string Amethyst Real Gemstone Mothers Bracelet with 4 names with a lobster claw clasp. The first string says Bella Blu and the second string says Olivia Harlow. They picked Amethyst Birthstones and added an Amethyst Birthstone charm. The alphabet block letters are 4.5mm blocks made of all sterling silver. You choose the type of sterling clasp during the ordering process. You may have up to a 5-string bracelet with as many different gemstones as will fit. This is a 2 string bracelet. The first string is just gemstones. To order a bracelet like this one please enter NONE in the blank for the 1st string and choose your gemstones for the first string. 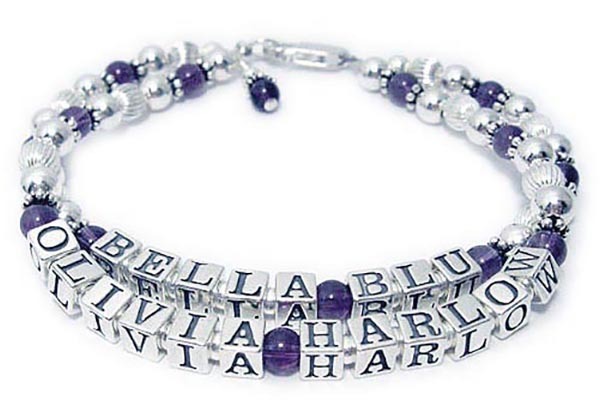 Enter OLIVIA HARLOW in the second name blank and pick the gemstones. This is a 2 string bracelet with 4 names with a lobster claw clasp. The first string says Bella Blu and the second string says Olivia Harlow. They picked Amethyst Birthstones and added an Amethyst Birthstone charm.